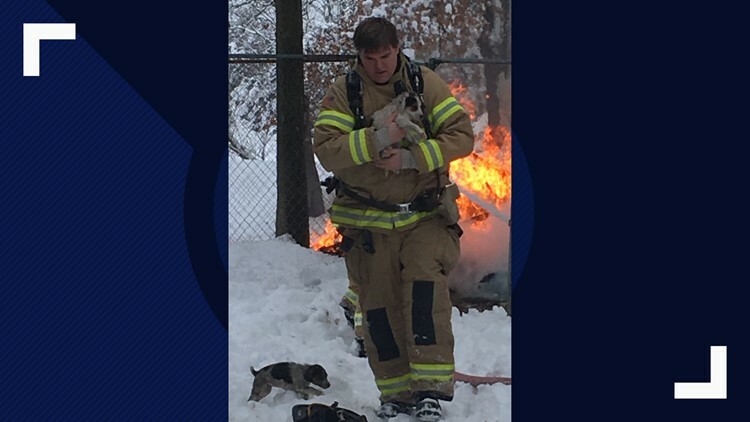 Firefighter rescues puppies from a doghouse fire in Wright City. Firefighters are hoping this story will serve as a reminder to keep other dogs safe in doghouses. WRIGHT CITY, Mo. — The Wright City Fire Department is hoping to keep other dogs safe after a dog was killed and 4 others had to be rescued from a burning doghouse Tuesday morning. A post on the fire department's Facebok page said the fire happened at around 9:10 Tuesday morning. The five dogs were trapped near the large doghouse that caught fire. Four of them were rescued, but one died. Fire officials are not sure what caused the fire, but they think it may be related to a heat lamp used to warm the doghouse.